While being raised in Louisiana, it was difficult to distinguish by the weather when summer had departed and autumn hushed in its place. Foliage and temperatures never seemed to alter, but there was one event that took place in the kitchen, which inaugurated the turn of the season. Like clockwork around this time of year, my mom would buy the most beautiful red and green apples she could find, lined them all in a row on our ivory-speckled Formica countertops. She speared them with snowy lollipop sticks and deliberately dipped the rosy apples in a fiercely red candy concoction and spun them ever so slightly so the neon confection perfectly coated the matte skin of the ruby apples. Jade-hued apples were adorned with a disk of latte-colored caramel conveniently prepped with a teeny hole in the center to fit over the sticks. She popped them in a warm oven where the caramel leisurely oozed, skirting the apples and finally pooling at the bottom of the baking sheet. 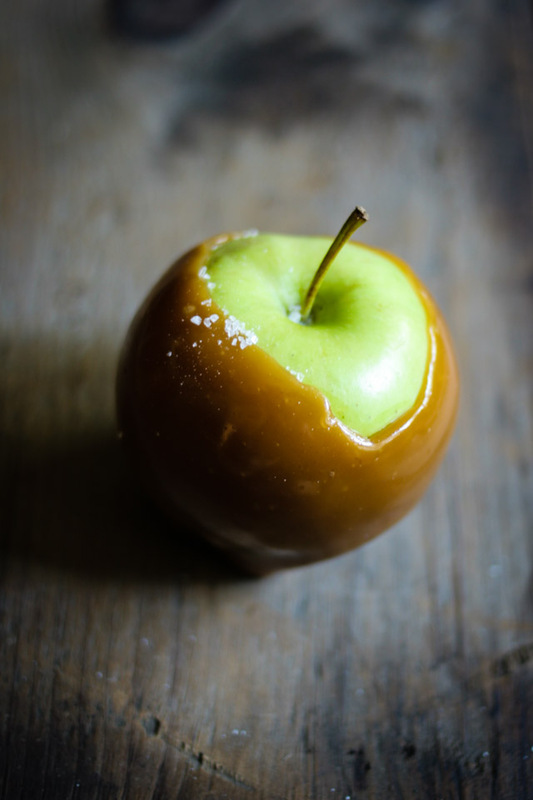 I remember watching my mother stand in charge over the scalding sugars and melting caramel like an enchantress at her cauldron churning out one flawless apple after another. Bubbles had mysteriously suspended in the thick, gleaming façade, wafts of sugar pervaded my senses, the hard coating covering the apple cracked under much application of my tiny jaw, and my chin was neon red and tasted somewhat of caramel for the rest of the afternoon. I knew in that small, sweet kitchen fall had officially begun. Note: You can use any apple you like for this recipe, but I use Golden Delicious (they are a favorite of mine!) Also, instead of using wooden skewers for the apples, I used twigs that had been thoroughly scrubbed and dried to give the dish a more natural look and feel! Insert a stick into the center of each apple and set aside. Place 1 cup of the corn syrup, butter and sugar in a medium saucepan over medium heat and stir until the butter has melted and the mixture is well combined. Bring to a boil. Swirl the pan every few minutes while the mixture is boiling, and cook for 8-10 minutes or until the temperature on a candy thermometer reaches 275 degrees. Remove the pan from the heat and stir in vanilla, remaining ½ cup of corn syrup and sea salt. 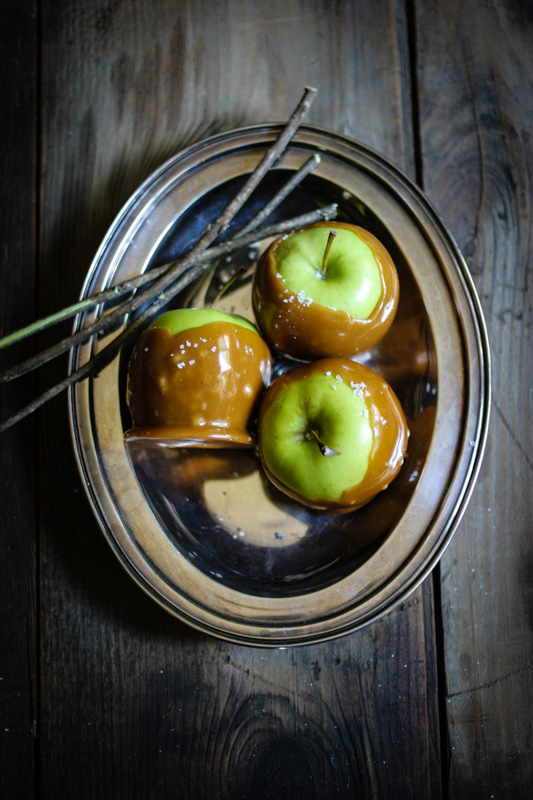 Dip the prepared apples into the caramel and place on a cookie sheet fitted with a piece of parchment paper. Sprinkle the tops of the apples with more sea salt if desired. Set aside for 30 minutes to completely harden. Enjoy!